Located where the former Woo Ying's Vegetarian 如意吉祥素食 was, Greenday Vegetarian 綠日素食 is the new kid in Pacific Plaza 太古廣場. Comparing to its successor, Greenday's menu is a lot simpler. The stall no longer offers those quick ready-to-go combo plates as everything is now made-to-order. 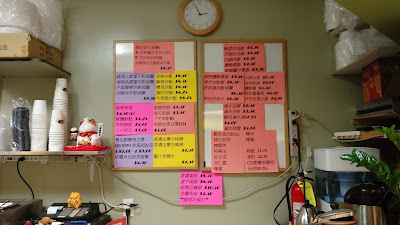 The large hot tea dispenser at the front counter for customers to refill no longer exists. 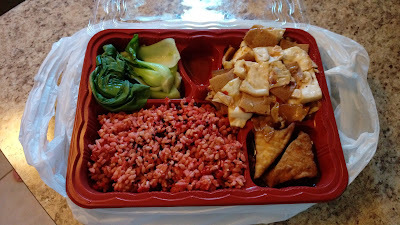 I ordered a takeout of Twice-Cooked Pork on Rice 回鍋肉飯 and it came in a to-go bento box with five-grain rice and two sides (bak-choy and tofu). The meatless protein was a sauteed blend of vegetarian pork belly, cabbage and pressed tofu. The stir-fry had no spiciness and it was a bit strong in bean paste. 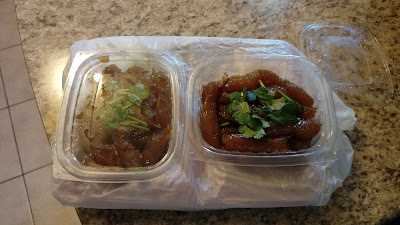 The two orders of Spicy Tendons 香辣蹄筋 were not the ones I was looking for. 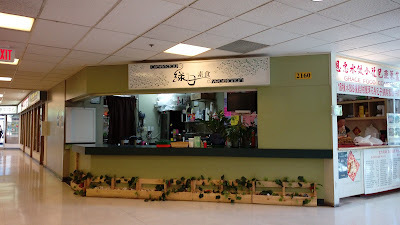 You see, previously at Woo Ying's, the owner/operator offered containers of vegetarian tendons made by a homemaker (who also supplies to Mei Lian Food Company 美廉食品公司 on Maycrest Way in Richmond). The texture of those vegetarian tendons made by the homemaker was similar to real meat tendons. I often purchase those tendons to make my vegetarian beef soup noodles during my annual vegetarian month. 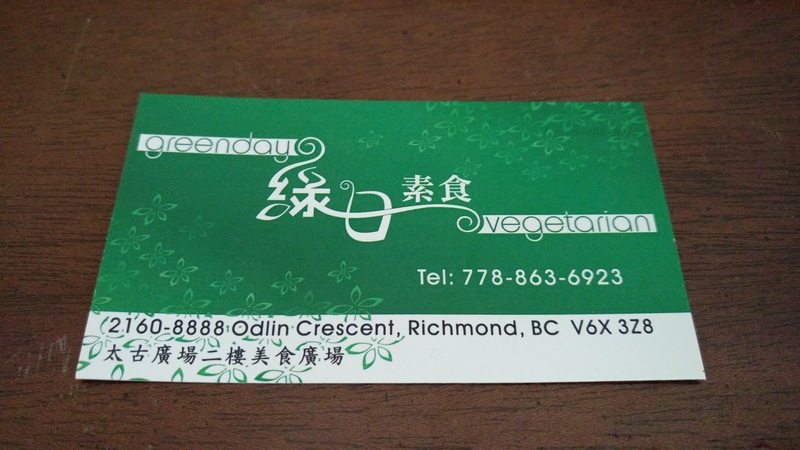 Unfortunately, the tendons offered at Greenday were the commercial quality frozen packages that can be purchased from Reshine Vegetarian Foods 瑞香素食 (Facebook page) on Alderbridge Way by Shell Road in Richmond. The commercial grade tendons were too firm and had an unusual hard crunch. In 604, there aren't many food court stalls that offer Chinese-style vegetarian food so it's good to have an addition to the list. Because the food is made-to-order, wait time can be long. Unless you have a lot of time to kill, I'd suggest to call and place your order in advance.